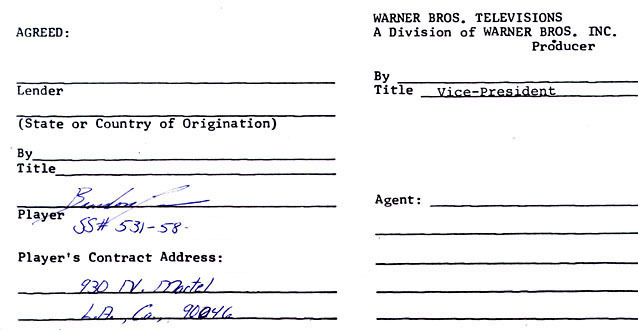 Shown above, Brandon's signature on his Warner Brothers Television/Movie contract. 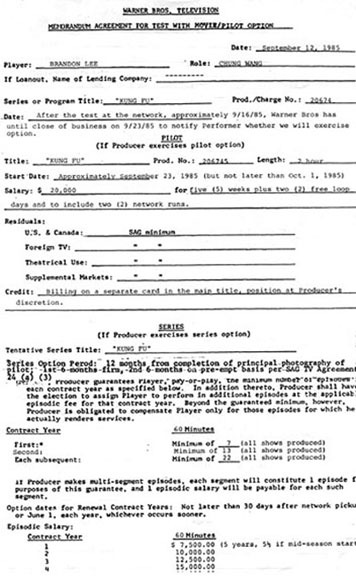 This memorandum agreement was for a screen test with a movie/pilot option for the program "Kung Fu", and specified an initial payment to Brandon of $20,000 for 5 weeks of work. This exceedingly rare document has tremendous provenance coupling him with the art that made his father's career. 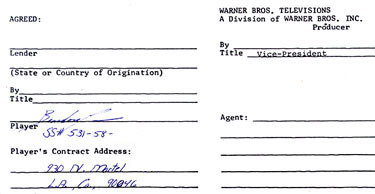 Given the tragically short life of Brandon Lee, this contract represents one of a very few documents that was ever offered on the market from this rising star's career. This is the earliest known TV or film document signed by Brandon.  It was sold at auction directly from Brandon's estate to a private collector in 1995. 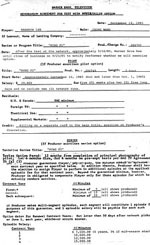 Below, the front page of the 2-page contract.